Is it a serious challenger to the M1911 .45 ACP? The venerable 1911 is being challenged for dominance by Glock's new Model 37 chambered for the also-new .45 GAP proprietary cartridge. For the first time in its history, the .45 ACP has serious competition. Though without a doubt a powerful handgun, recoil of the Glock 37 (opposite) is controllable, and high-speed shooting sequences are relatively easy to accomplish. For almost a 100 years, the Browning-designed Colt M1911 .45 ACP has reigned as the penultimate fighting handgun. Used in every major military action and countless "dirty little wars" during the 20th century, it quickly became legendary for its reliability under adverse environmental conditions, superior intrinsic and practical accuracy, excellent user-friendliness and superb stopping power. Even as the years rolled on, the M1911 seemed to get better and better rather than just older. Based upon its success as a military handgun, many police agencies and individual officers opted for it, finding it to be as fully capable as a police handgun as it was in its original military role. The reputations of famous lawmen such as Melvin Purvis (who carried two M1911s) and agencies like the FBI were made using it. And though it performed magnificently as a fighting handgun, it was quickly discovered that it was really accurate, too, prompting its use in myriad bull's-eye matches and finally, beginning in the 1970s, IPSC competition. There it made its mark immediately as "the gun to beat." Every major event was dominated by M1911s, and virtually all the winners used them, prompting the less skilled to adopt the M1911 wholesale in the not-unrealistic belief that they'd have a better chance of winning if they used one. The 1980s brought the Colt M1911 widespread emulation, for by the end of that decade, more than a dozen makers had copied it and were offering various versions of it. Now it can be found in virtually every possible configuration, every size category and multiple calibers as well. Built on the same frame as the famous Glock 17 and Glock 22, the new Glock 37 in .45 GAP is tough, accurate, highly user-friendly and possesses equal stopping power to the M1911 .45 ACP. And now, even though "Old Ugly" is nearing its 100th birthday, its popularity continues, showing no signs of lessening. 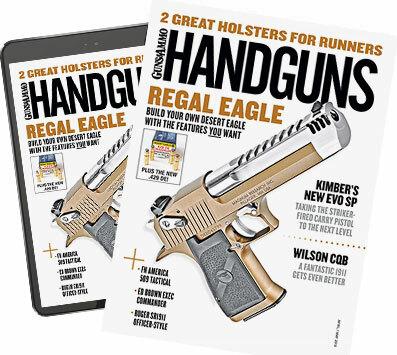 It continues to reign supreme as the quintessential fighting handgun and is undeniably the longest-running act in handgun history. Because of its capabilities, the M1911 remains the choice of hundreds of thousands of shooters of all kinds. Its place in history assured, the M1911 has no peer, for no other handgun has successfully challenged its place as king of the hill, the best of the fighting handguns. Until now, that is. Because finally, after nine-plus decades of unquestionable superiority, the M1911 faces the first serious challenger in its history--the new Glock 37 chambered for the proprietary .45 Glock Automatic Pistol (GAP). First appearing back in the mid-1980s, Glock pistols are also no secret to anyone, nor is the fact that they've quickly come to dominate the law enforcement and civilian self-defense markets. This phenomenon is based upon the fact that the Glock's fundamental design is truly revolutionary (in fact, the only new concept since the mid-1930s), and it is extremely simple, robust and user-friendly, too. Following the newest trend, rails for the use of a detachable SureFire or other flashlight system are standard on the Glock 37. For a fighting handgun to reach greatness, there are a number of essential characteristics it must possess. Specifically, it must be clearly superior in four ways: 1) mechanical reliability, 2) practical and inherent accuracy, 3) stopping power and 4) user-friendliness. These are the characteristics that allowed the M1911 to attain legendary status and have since become the criteria used to measure, and thus rate, the capabilities of all fighting handguns. That's the reason comparisons with the M1911 are invariably made. Well, the last 15 years have shown that Glocks are without a doubt among the most--if not the most--functionally reliable pistols ever made. In addition, they're not only highly accurate but also very simple in concept and operation and are thus highly user-friendly. This makes them clearly superior to the vast majority of handguns on the market today and catapults them to the top of the preferred-pistols list. This leaves only the matter of stopping power to consider, and it is here that most handguns fall short. Without a doubt, the .45 ACP's reputation as a manstopper is well deserved, due in large part because it was one of the few handgun cartridges in history that was specifically designed for combat. Like the M1911 pistol for which it was originally created, the .45 ACP has become legendary because it offers superior performance. It's accurate, easily adaptable to a variety of missions and purposes and, for self-defense functions, offers unequalled stopping power--a tough combination to beat. Since 1987 when I began testing and seriously using Glocks, I've begged, badgered and cajoled my friends at Glock Inc. to produce a standard-frame .45. Throughout the last 15 years, I've brought it up again and again, to the point where every time I'd call someone at Glock, he'd begin the conversation by saying, "Hi Chuck. Yes, yes, I know. We ought to make a standard-size .45. Now. . .what else can we do for you today?" But amusing as it was, my preoccupation with the idea was no coincidence. Almost from the outset of my association with the Glock pistol, I recognized its design superiority and thus its potential for greatness. Moreover, in only a matter of weeks after exhaustively testing the original Glock 17, I realized that if an identical pistol were produced in a caliber larger than 9mm or .40, it would very nearly be the ideal fighting handgun. w years later, the compact Glock 30 .45 ACP appeared. As a compact, it was easier for shooters with average or smaller hands to handle, but, like the Glock 21 from which it came, it was a bit thick in the grip frame for my tastes. Toward the end of the 1990s the thin-framed Glock 36 surfaced and was an immediate success. However, given the limitations of compact and subcompact pistols and their resulting hybrid mission, I was still dissatisfied. I didn't want a compact; I wanted a full-size, yet standard-framed service pistol like the Glock 17 or 22, but I wanted it in .45 caliber. I'd just about given up when in February 2003 I received a call from one of my contacts at Glock, who cheerfully advised me that my dream was about to come true. The firm was about to offer the pistol I'd been requesting for so long--the Glock 37. However, I was advised that it was to be chambered for a new .45 cartridge, to be called the .45 GAP (Glock Auto Pistol) and not the ubiquitous .45 ACP. When I asked why, I was informed that the Glock engineers felt that a slightly shorter cartridge based upon the .45 ACP would offer better functional reliability and yet duplicate its performance. Further conversation disclosed that Speer would be the initial ammunition manufacturer and that it would be offered in both a 185-grain Gold Dot JHP and 200-grain flatnose FMJ loading. Specifications for the ammunition had been requested by the other ammo manufacturers, however, and it was almost a sure bet that they would soon join Speer in producing the .45 GAP. Enthused by what I had heard, I asked for the first one unpacked to be sent to me, and that promise was fulfilled. Wide fixed front and rear sights, featuring white-dot and white-outline square-notch sights, are also standard on the Glock 37. Now, in the early fall of 2003, the Glock 37 .45 GAP is finally here, and a handsome pistol it is. As this is written, I've now run 500 rounds each of Speer's 200-grain FMJs and 185-grain JHPs through it without a hitch. The ammo is a bit hotter than I originally expected, with the 200 grainer producing 991 fps and the 185 grainer 985. Extreme spreads for both loads have thus far hovered in the four- to 12-fps range--exceptionally tight for any cartridge, much less a handgun cartridge--and accuracy is excellent. From my Ransom Rest, my Glock 37 consistently produces 50-meter accuracy in the two- to three-inch range, while from offhand Weaver, I've been able to shoot 25-meter groups of less than two inches without difficulty. Fired in low-light conditions, virtually no muzzle flash is apparent--a nice touch since self-defense is the primary function of both the firearm and its ammunition, and the vast majority of such encounters take place between dusk and dawn. Interestingly, the 200-grain FMJ is also a bit hotter (991 fps) than the 185-grain JHP (985 fps) and is therefore slightly less controllable in fast multishot sequences. This, along with the fact that the Gold Dot JHP used in the 185-grain loading appears to expand reliably (to the chagrin of a dozen jackrabbits and a coyote), leads me to prefer it to the 200 grainer because weapon controllability in self-defense situations is critical. To actually measure this, I performed a series of high-speed drills taken from the extremely difficult American Small Arms Academy Handgun Combat Master Qualification Course. I found that the time differential between the two loads for two-shot strings from the holster on a single Taylor Combat silhouette target at distances of three, seven, 10, 15, 25 and 50 meters to average a substantial two- to three-tenths of a second. Multiple target drills consisting of one shot from the holster from five meters on two, then three, and finally four TC silhouettes in 1.2, 1.5 and 1.8 seconds, respectively, confirmed this trend. The lesser controllability of the 200-grain load forced me to accept either a lower score to avoid overtime penalties or an additional two-tenths of a second longer per shot being needed to ensure a perfect score. Using the 185-grain JHP load, however, maximum scores were shot on all three stages with relative ease, once again confirming my subjective impressions from my earlier experience with the two loads in the field. A third drill was also shot from seven meters and consisted of presenting the pistol from the holster and placing a single hit on the target (also a TC silhouette) in one second. Because only single shots were involved, there was no difference in time, but the Glock 37 fully equaled the performance of the Colt M1911 from an identical holster. ered, as are all Glocks of recent production. In comparison to the M1911, the Glock 37's slide is slightly wider (1.125 inches in comparison to .090) but lower in height (.890 inch as opposed to 1.450). Overall height measures a 1/4 inch less than the M1911's 5.25 inches. So, as you can see, from a size standpoint, the Glock 37 compares favorably with the M1911 and is certainly no less concealable or convenient to carry. Magazine capacity is 10 shots, and all magazines are drop-free, making speed loading an easy task. As with all other Glocks, the sights are of the fixed, high-visibility type, featuring a .360-inch-wide front sight with .3-inch-diameter white-dot insert and a .320-inch rear notch with a .050-inch white outline. Weight, Empty: 24.5 oz. 39 oz. Weight, empty mag. 2.7 oz. 2.4 oz. Length, overall: 7.8 ins. 8.2 ins. Length, slide: 7.4 ins. 7 ins. Length, barrel: 4.6 ins. 5 ins. Height, overall, w/o mag: 5 ins. 5.25 ins. Height, slide: .89 in. .90 ins. Sight radius: 6.5 ins. 6.6 ins. Mag capacity: 10 rnds. 7 rnds. So as you can see, the Glock 37 is at the very least a winner and is sure to become an immediate tactical and commercial success. Like the other Glocks from which it came, it's tough, reliable, simple, accurate and, in this case, a real manstopper but without the controllability problems associated with the .357 Magnum, .40 S&W or 10mm. As such, it clearly offers a real challenge to the venerable M1911's status as king of the hill, the first such challenge in nearly a hundred years. With proper ammunition development it may very well supplant it. Time will tell, of course, but I can already say that based upon the results of my testing thus far, I prefer it to either the Glock 17 9mm or Glock 22 .40 S&W because it possesses all the same attributes and has, in addition, the superior stopping power of a .45. Such a combination is very, very hard to beat and is sure to move the Glock 37 to the very top of the list.